As part of the next incarnation of the Lucida typefaces, I’ve been testing out the OpenType versions of the maths fonts. It’s fair to say that most people will have seen a Lucida font in one form or another. Lucida has been very popular in the past as one of the very few commercial and unique maths fonts for TeX. It is a super-family of fonts with more font faces than I’m aware of in any other such collection, including serif, sans serif, typewriter, script, blackletter, handwriting, casual, fax (a sturdier serif), and symbols or wingdings. It has been distributed very widely on various computer systems, with Lucida Grande used in Mac OS X itself (the menu font, among other uses), and Java and Windows shipping the standard serif/sans/mono trio for many years. For more information about the Lucida fonts and their new release, Ulrik Vieth and Mojca Miklavec have just published a TUGboat paper with all the gossip. (Link accessible for TUG members only until it becomes open access in one year.) Further information can also be found on TUG’s own site for the font and an overview of the fonts written by the font designers, Charles Bigelow and Kris Holmes. Due to my particular interest in Unicode maths, I’m especially excited to see a new OpenType maths font on the scene. I like to think that we’re entering into somewhat of a golden age of maths font design, as OpenType provides a mechanism by which both TeX users and GUI apps such as Microsoft Word can use them; in times past, it was simply rarely worth the expense of creating a new TeX maths font and this is evident by the relative paucity of them. shown with approximate symbol counts for each font (based on symbols defined in unicode-math, not by literal glyph count). The STIX fonts are the reference, here, and contain the largest number of symbols; I believe recent versions of Cambria Math have more than is listed above. But what is impressive to see is that not only does Lucida have a large glyph coverage already, but it will also be provided with a ‘bold’ version of the font as well and, as far as I know, will be the first OpenType maths font to offer this. 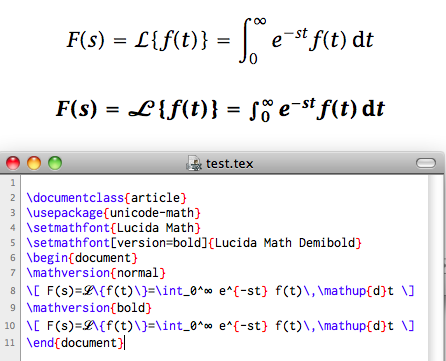 To facilitate the use of the bold font, unicode-math can now load multiple maths fonts simultaneously through LaTeX’s \mathversion command (although this new feature hasn’t been widely tested), which is shown in the image above. Note in the image above the integral sign for the bold example isn’t scaling yet; this will be rectified of course for the release version of the fonts. I’m very pleased to be able to play whatever small role I can in bringing these fonts to new audiences. Many thanks to Charles Bigelow and Kris Holmes for working on the new fonts and everyone involved in the OpenType transition but particularly the seemingly tireless Khaled Hosny. Great work!